Southern California has the Rock Store. 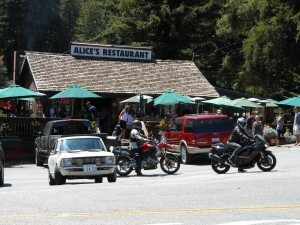 In the Bay Area, Alice’s Restaurant is the place for riders of all stripes to see and be seen. Located in the coastal range just west of Woodside, at the intersection of highways 35 and 84, Alice’s draws huge weekend crowds of sport riders and cruisers alike who come to show off their machines, grab a beer and ride the twisty mountain roads. The parking lot in front of Alice’s, which is not the restaurant of Arlo Guthrie fame but uses the lyrics in its slogan nonetheless, is typically packed with all manner of bike – from bobbed-out Harleys to exotic racers and all types in between. On sunny weekends, bikes spill into neighboring lots and onto the shoulders of the road as people walk among them, admiring the gleaming paint and steel, talking shop or sharing road information. “Whole bunch of cops down there,” a guy with a leather suit said as he dismounted a Ducati. “Thanks, bro,” another guy said. Roads leading to and from are nice but the weekend brings cars. Lots of cars. The peninsula hotspot is sandwiched between San Francisco and San Jose, so even though it feels like wilderness it ain’t. Inside the restaurant, they’re usually slammed. You can have anything you want, as they like to say, but mostly people go for the cheeseburger. And a beer. People come from all over. 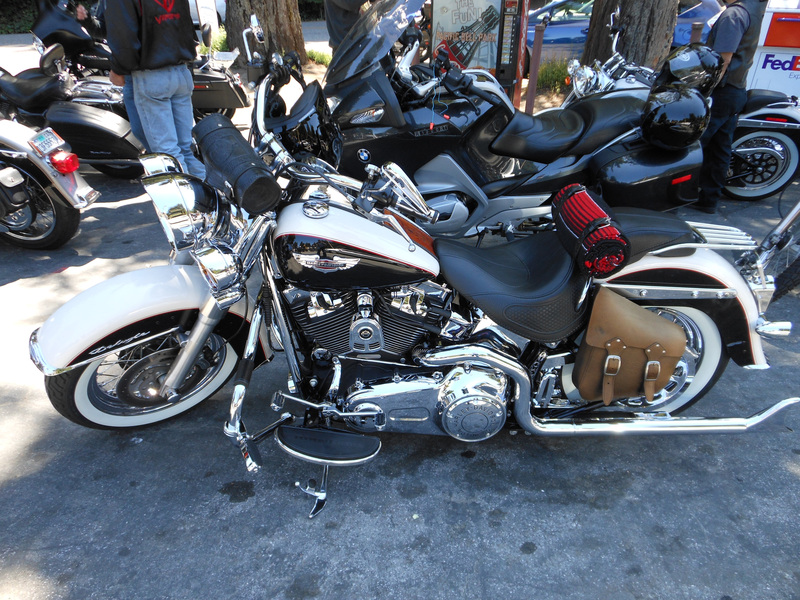 Three Harley guys said they rode from the Central Valley town of Manteca just to take in the scene. Another man and his wife came from Lake Tahoe and were headed south to Santa Barbara. Then there are the locals. The community of Sky Londa and environs have a hippie past that includes being home to Ken Kesey and his Merry Pranksters. The VW buses have mostly been replaced by SUVs owned by Silicon Valley executives but look closely as you whisk through the woods and you’re likely to spot a yurt or two. I lingered in the parking lot after eating a bowl of chili (watery, bland) and drinking a Sierra Nevada (cold and excellent). The crowd was thin because of a motorcycle race at Laguna Seca. A BMW owner from nearby Palo Alto was hawking custom lights that increase visibility but also are considered illegal by the CHP. He bragged that the roads south of Alice’s on Skyline Drive are some of the best in Northern California. The asphalt is smooth, save a few pavement “alligators,” and there are plenty of sweeping turns, he said. I came in from the north (I-280 to 92 to 35) and was less than impressed by what I’d seen so far. The roads were on par with Santa Monica Mountain roads leading to the Rock Store but bumpier, narrow and full of cars. At the man’s suggestion, I headed west out of Alice’s parking lot down 84 toward Half Moon Bay. Took a few nice sweepers before getting stuck behind traffic. It was more of the same on Highway 1. By Half Moon Bay, the cars seemed to be reproducing and multiplying. Highway 92 east was bumper to bumper almost all the way back to 280. While traffic dampened the experience for me, I’d say Alice’s is worth a visit, if for no other reason than to eat a meal, ogle bikes and chat with people with a mutual interest. They say you should never talk politics or religion with strangers. 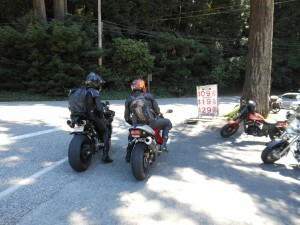 Motorcycle riders can add another off-limits topic – oil. The thick liquid that is the life-blood of all combustion engines is a source for endless bickering and disagreement. Riders spar over which brand is best, whether one should use synthetic or not, filters and, of course, how often oil should be changed. Search almost any motorcycling forum on the Internet and you’ll find heated debate accompanied by insults and hard feelings. 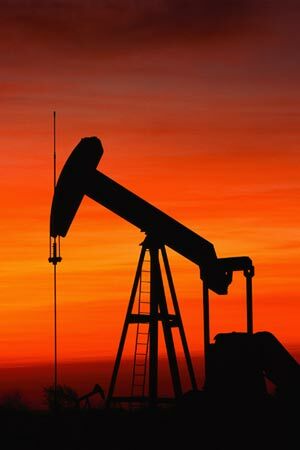 Oil, like politics and religion, is one of the areas where people don’t back down from strongly held beliefs. Usually, the fight is on when someone poses the innocent question: Which is the best oil for my motorcycle? Opinions come fast and furious and divide into several camps. There are the synthetics-only, who usually make up the majority; the smaller “dinosaur oil” traditionalists; the exotic brands and special additives group and the I’ll-use-anything-as-long-as-I can-buy-it-at-Walmart crowd. All will tell you their oil is best. They’ll boast trouble-free riding years or make various claims about gas mileage and performance. Others will question the wisdom of $10 per quart synthetics or obsessive oil changing at 3,000-mile intervals. Someone will always maintain they use cheap car oils with great success. Talk usually comes around to filters. Every once in a while someone will cut one open with a hack saw and make observations about filter area and material. No one can ever agree on anything. But there are some truths. The first is you should always use the grade of oil specified in your bike’s owner’s manual. Put in just enough, being careful not to overfill. Top off your oil with the same kind. Don’t mix. And don’t use car oil. Motorcycle oil has special additives that prevent things like premature clutch and transmission failure. Unlike most motorcycles, cars have separate oil compartments for engine and transmission. When it comes to changing your oil, don’t heed the 3,000-mile commandment. It’s a myth perpetuated by industry types that oil must be dumped so soon. Many mechanics now say you can go 7,500 miles or more between changes. How long will you go? And of course, recycle your oil and filter. The following is a guest blog submitted by Indian owner Glenn Heimler of Thousand Oaks, Calif. Glenn rides with a unique passenger – his dog Neko. Today was the last of three days off and I didn’t have too many things to do. So I rolled the bike out, warmed it up, got Neko’s sun glasses and my gear and set out toward the Rock Store on Mulholland Drive in the Santa Monica Mountains. On the way out, my little buddy got situated in the sling and enjoyed sticking his nose into the wind. When we arrived at the Rock Store, to my surprise it was closed. It was Thursday around lunch time, and no other riders were hanging out, so we just kept cruising and headed up and over Kanan Road to the coast. At Pacific Coast Highway we turned north and rode through Free Zuma, as Neko wanted to check out the bikini scene, then continued north up to Neptune’s Net restaurant which is located on the Ventura-Los Angeles county line. We stopped to water ourselves and Neko was quite an attraction to even the nonriders. We hung for a bit and soaked up the attention. 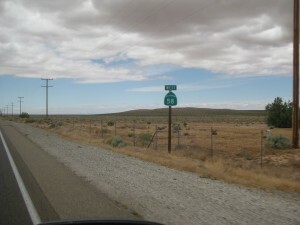 After leaving Neptune’s, we continued north to Deer Canyon Road which takes us back up into the mountains. We rode up to the top ridge to view Boney Mountain. By that time I thought we had a tire fire so we both got off the bike to put it out. We got rolling again and eventually circled back to the coast. While cruising at about 70 mph with nobody around we spotted a flock of seagulls enjoying some road kill in our lane about 100 yards up. We slowed down to about 50 mph. I was expecting them to fly away before we were on top of them. That didn’t happen. They took flight too late. I hit one square on with my windshield and the other got wedged in between my right mirror and throttle. The force was strong and almost laid us down. I checked my shorts (!*? @#) and was ok, lifted Neko’s tail and he was ok. So we continued up the road past the old State Hospital. It was featured on the cover of the Eagles’ Hotel California album. Then we rode back into the mountains on the other side of Boney. This little section of road is just great. Nobody hardly on it and the scenery is nice. Takes you past the hospital, through a small valley and back up on to a plateau where it passes a horse stable and gradually brings you back into town. I’v taken this route many times but it seemed a little extra special to have my buddy Neko and to be on my Indian. What more can you ask for? And how I get him to ride is I put him in a newborn baby sling that I bought at Babies R Us. I put it over my head a one arm through. The sling hangs down to my waist and my top thigh. Neko fits comfy all the way in with just his head out. He likes to hang 10 with his front paws out and just his body inside the sling. I start tweaking song lyrics when I’m blasting down the highway on yet another solo run. I’m finding myself doing more one-man rides as the season kicks into high gear. For some reason, my usual cast of riding buddies are bowing out. And friends I’ve been pestering to buy bikes seem to be putting off for another year the start of their real lives. No matter. I go it alone. Unlike George Thorogood, I don’t call on Jack Daniels or Jimmy Beam to accompany me. Although I might turn to one of buddy Weiser’s tastier relatives at some point. Nothing like a cold beer. 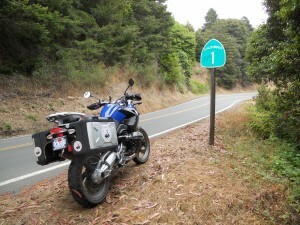 It was the case last week when I set out on two, 350-mile rides in Northern California. The first was a heat avoidance mission that took me up the bracing North Coast of California through Sonoma and Mendocino counties. And you know what? It wasn’t that bracing. Temperatures topped 85 degrees, defying Mark Twain’s assertion about cold San Francisco summers. It’s a solid ride, but one I’ve done a dozen times before. Your mind drifts as you cover the all-too-familiar ground. Did I close the garage door? Is my wife mad at me for being gone so long? Is the dog depressed? Then comes the singing. My voice sounds pretty good when it’s bouncing off the inside of my helmet. Deep in musical thought, I round a corner at 80 and find a slow-moving motor home in my path. That’s usually when I take a rest stop. On this ride, I pulled over in the tiny town of Leggett, where hippies and lumberjacks coexist amid the odors of ripening weed. The Peg House touts one of the best bacon cheeseburgers in the west, so I ordered one, along with a beer. I consider myself a people person but my words to the cashier were the only sounds I would make. As the meat cooked, I listened to other customers talk. A guy in tie-die prepared an outdoor stage, occasionally mumbling to himself. The burger arrived. It was good but not great. I ate it in silence and was off. I picked up Highway 1 and rode west, donning extra layers before emerging on the shimmering coast and heading down to Fort Bragg. Fort Bragg, the former mill town, was awash in tourists soaking up its Victorian charm. I seized the chance to soak up a beer at the North Coast Brewing Co. and continued south, hitting Mendocino and then hanging a big left turn at Highway 128. As I’ve mentioned before on this blog, Highway 128 is not to be missed. Its cambered turns, open straights and smooth asphalt make you feel like you’re on a track. But take care. You’re not. Plenty of slow traffic and California Highway Patrol officers, too. I was face-to-face with a Chippy who did a u-turn in the middle of the highway to go after a speeder. He looked angry as I slowed and waited for him to complete a three- or maybe four-point turn. He sped off, chirping his tires. I high-tailed it, too, jumping quickly into triple-digits with the knowledge the only cop for 50 miles was moving fast in the opposite direction. Before I knew it, I was home. I spent a day out of the saddle before embarking on ride No. 2 from Santa Rosa to the foothills town of Murphys – and back. But there was a twist. I was meeting an old friend from Stockton who owned a motorcycle. I was excited at the prospect of riding with others. I raced across the San Joaquin Delta in an early morning fog, anticipating an adventure. I wasn’t disappointed, but my friend clearly lacked my enthusiasm. Turns out he hadn’t taken his bike from the garage in a few years. We rode at a slower pace the 70 miles or so into the foothills, stopped for lunch and then he announced he had to go back. It was still mid-day – well before quitting time for me. I pulled out a map and plotted a meandering route home. 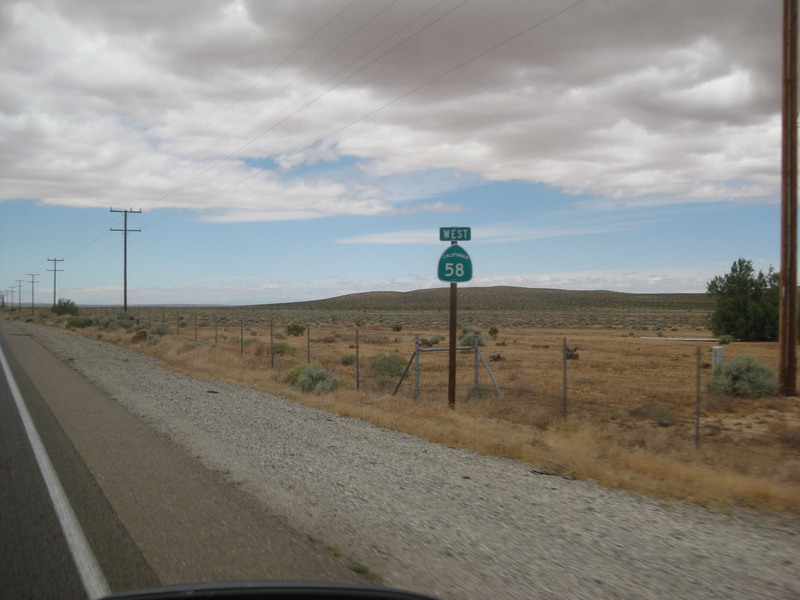 Alone on historic Highway 49 I considered the fact that motorcycling is a solitary endeavor. You can ride with groups or install walkie-talkies in your helmet, but there’s no escaping the reality that you are alone. And maybe that’s just as well. More beer and high speed for me. Summertime and the riding is easy. Or is it? The road beckons in summer but so do my family members, who’ve usually planned a series of camping trips during peak riding season. It’s an annual tension that typically ends with me going camping. As a compromise, I will sometimes ride my bike as my wife pilots our gear-laden SUV to the nearest state park. This year, I was able to beg off three nights in a tent. My schedule changed and I had to work. But since my wife and daughter were staying just an hour away on the scenic Point Reyes National Seashore, I seized the chance to ride out for dinner one night. It was a good chance to road test the bike, which had just been repaired by my new, independent mechanic, Michael Pettis. Turns out, he did a great job. The bike purred like a kitten on the gorgeous 60-mile round-trip that takes you from the rolling farm country of west Petaluma to the redwood groves of Marin County. On a weekday night when there’s hardly and traffic, you can fully appreciate the beautifully banked highway that wraps around the west side of Tomales Bay. On the long straight at Nicasio reservoir, I got into the triple digits, flying past a lonesome fishermen standing on the shore. If you’ve never ridden this part of California, you are truly missing out. Marin and Sonoma counties are motorcycling nirvana. The roads and the scenery are unmatched. Just don’t come on the weekends, when crowds descend. And watch out for police, who have become increasingly aware of the region’s popularity among those who will go fast. If like me, you must balance family obligations, the North Coast will serve you well. My wife likes to camp at Samuel P. Taylor state park near Fairfax. It’s kid-friendly, has a great swimming hole and is not far from the spectacular Point Reyes peninsula. On my short visit, I saw a number of motorcycles parked alongside mini-vans. Best of both worlds?